To design a place with consideration, the design allows some things to be left to chance. Lines and edges are created that can encourage subtle adaptations. Instead of deciding every experience, there are moments for the unexpected. A designed landscape is an interpretation of a place that can be offered back to its community to be adopted as their own, and to be reinterpreted through lives and stories. In a dramatic shift of scales, a designed landscape is almost like the drawn black lines of a coloring book; it beckons to be altered and re-imagined by those who confront it with pens and pencils. On September 6, 2015, Outsider Gwendolyn McGinn, and her partner, Isaac Cohen of buildingcommunityWORKSHOP, debuted The Dallas Coloring Book Experiment at the first Dallas Zine Party. The Dallas Coloring Book Experiment is a series of coloring books. They contain a collection of drawings which present different interpretations of the city. Each edition of the coloring book takes a slightly different approach to what “coloring book” means with drawings that are meant to be interacted with, colored, cut, and reimagined. Part coloring book, part interpretation of a city, part collected histories of a place. TDCBE is an experiment in alternate ways of engaging the city. 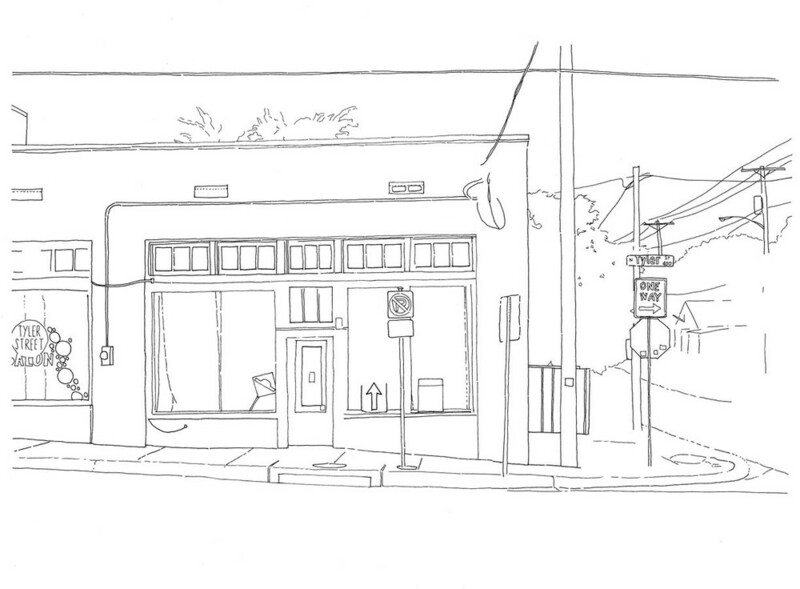 Instead of drawing projected futures, TDCBE presents line drawings of the people and places that form the city. Collections of street corners, sidewalks, and signs begin to form a visual documentation of vernacular structures of the city. Places that we see everyday, are illustrated and layered to present the memories of a place instead of a perfectly drawn architectural record of a place. By seeking drawings from many artists and designers, The Dallas Coloring Book Experiment begins to form a collective story of Dallas created by those who inhabit it. The act of drawing and coloring one’s own city begins to form conversations of what the city is, and how else it might be imagined. The act of drawing the city presents an appreciation of the places where lives are lived and stories are told. While Reunion Tower and other iconic emblems of Dallas might tell the story of Dallas to some, its sidewalks and bus stops have deep stories of their own. The first series of The Dallas Coloring Book Experiment included drawings from several Outsiders. A selection of their drawings are included below. As a studio there are times for serious critical engagement, and times to playfully express the world around us. Through lines we can depicts unfinished places, and share them for others to make into their own.